Advantages: Superb range of photographs, excellent clarity, scale plans, informative text. Colin Owers gave us the first instalment of World War One’s “Bloody Paralyser” with Datafile 116. 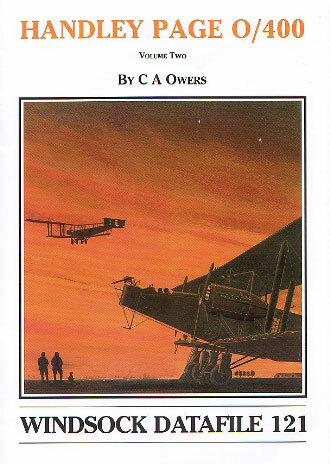 The follow up volume has now been published and this completes the study of the famous Handley Page 0/400. The first thing that strikes the reader is the evocative cover art by Ray Rimell. This sets the tone for the very high standard of the publication. The soft card covers contain the usual 36 pages which continue where the volume 1 left off. Here we find the details of the bomber described whereas its predecessor contained the type’s history and development. This is done with over 65 black and white photographs. Amongst other sources, the rare close ups come from contemporary official handbooks and these show amazing detail. Every aspect of the machine is covered. There are skeletal views of the wings; interior shots cover the fuel and oil tanks, bomb cells, cockpit, gunlayer’s position and every other area of the fuselage. The exterior is not forgotten with the engines, tail skid mounting, under carriage, Scarff ring, and pipe connections also being selected for special mention. The text describes all these areas in excellent detail and the author’s style does not bog the reader down in too much technical detail. Volume 1 saw general arrangement drawings to 1/72 scale. In this issue they are to 1/48 and are conveniently placed in the centre of the book. This allows easy removal as many of the views are spread over two pages. Bob Pearson supplies three colour schemes to round out the issue and the description of these and of the Handley Page in general, is covered amply in a colours and markings section. This certainly is a title for the “super-detailer”. The superb clarity and range of images presented is more than enough for those wanting to enhance the old Airfix offering. In fact there is ample information here to allow an enterprising manufacturer to produce a modern kit of this famous aircraft.